Friends - for those who would like a quick refresher on what the heck I'm up to - here it is! Its all about helping business live up to the vision that a successful business creates tri-profit - financial rewards, social benefits and regenerates the environment by sustaining "the possibility for human and other life to flourish on this planet forever" - an idea first put forward by MIT Scholar John Ehrenfeld (summarized here). Yes, not a small un-audacious goal! The why and how of this audacious goal is a big topic in its own right and I have a keynote talk (first delivered in December 2014 at Plymouth University) which discussed the goal in more detail. I'll be presenting this talk twice at the Centre for Social Innovation in Toronto in March (details of this event and then video of that talk and slides forth are coming). To contribute to realizing this vision in Jan 2012 I helped to co-found the Strongly Sustainable Business Model Group (SSBMG) hosted by the Ontario College of Art and Design University's Strategic Innovation Lab (or OCADU sLab for short)! . This is now a 340+ strong global community of professionals and academics on Linkedin (forum.SSBMG.com). We have another 200+ followers of the Strongly Sustainable Business Models page on Facebook facebook.SSBMG.com. The project has a very basic home page www.SSBMG.com, tweets @StronglySustain, has a YouTube channel tv.SSBMG.com, posts at blog.SSBMG.com, and maintains a wiki wiki.SSBMG.com. My specific project - the Flourishing Business Innovation Toolkit - is one of a number of initiatives being undertaken by members of the SSBMG. The Flourishing Business Canvas collaborative visual design tool is a key part of our Toolkit. The canvas is featured in recent workshops we started delivering last fall in Toronto, Cleveland, Hamburg and Plymouth - see my tweets @aupward for photos of the canvas "in action" with workshop participants. 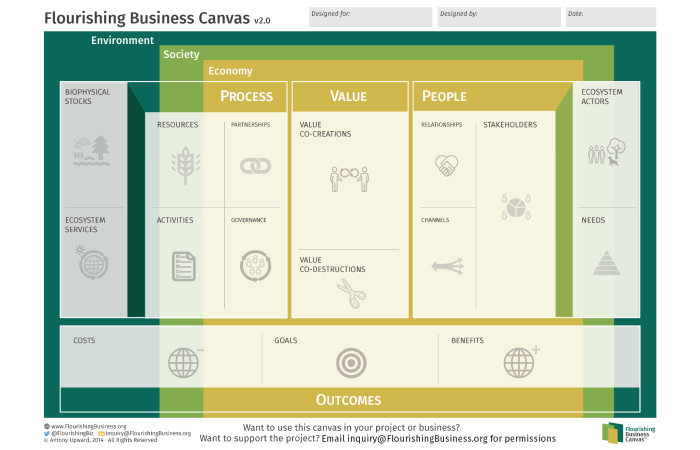 The new canvas is a significant improvement over the groundbreaking Business Model Canvas featured in the million selling crowed funded book Business Model Generation (a number of members of the SSBMG were funders of this important project!) . A ~3 min audio/visual intro to the Flourishing Business Canvas can be found at: about.FlourishingBusiness.org. More details about the canvas can be found in the learning map for the SSBMG wiki.ssbmg.com/home/learning-map. Creation of this new tool was initiated back in 2010 by me at York University - Faculty of Environmental Studies and Schulich Centre of Excellence in Responsible Business within the Business School (Full thesis can be download hdl.handle.net/10315/20777). All this was part of my graduate studies into Business Model Design and Sustainability. You can read more about the research on my company website www.edwardjames.biz/Research. (In case you're wondering the company was named, with a nod to questions of inter-generational sustainability, after my paternal and maternal grandfathers - Edward and James respectively). The project has its own basic, but soon to be improved, website www.FlourishingBusiness.org and tweets @FlourishingBiz. A facebook page is forth coming - updates are currently posted to the SSBMG facebook page facebook.SSBMG.com. 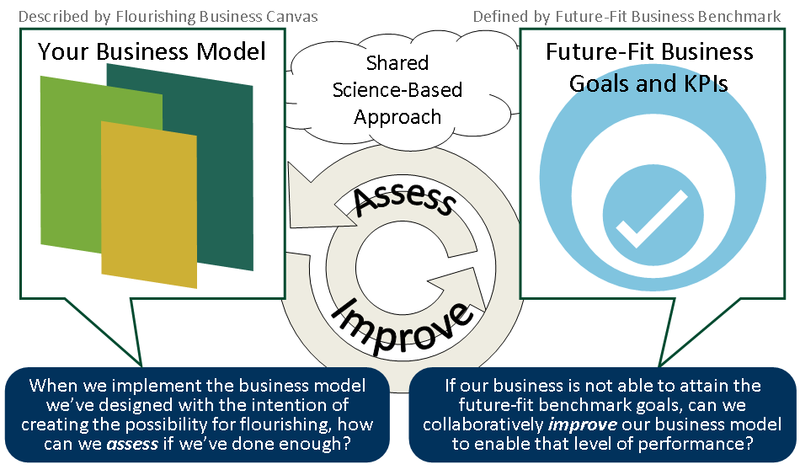 I'm also working on another project of the SSBMG, with Dr. Bob Willard (a globally recognized expert in the business case for sustainability who is also working on the Flourishing Business Canvas), the good folks at The Natural Step Canada and the 3D Investment Foundation in the UK (Geoff Kendall and Martin Rich) on another highly related project - the Future Fit Business Benchmark (intro video here: FutureFitBusiness.org). This project is asking the question: How would we know a truly sustainable, aka a flourishing or strongly sustainable, business if we saw one! I think that about says it all... oh and as you can see from others posts to facebook and twitter things are moving forward in a positive way! But, anyone who wants to help the project financially, the project team would love to talk to you. If you'd like to use the Flourishing Business Canvas you can - for free - just email inquiry@FlourishingBusiness.org and put "First Explorer request" in the email. If you want to show your support - like our facebook page - facebook.SSBMG.com or get more involved by joining our LinkedIn group - forum.SSBMG.com. In addition to working on these two and other project the SSBMG meets monthly F2F and virtually for interesting presentations and discussions about flourishing, aka strongly sustainable, business. Details when you join the linkedin group.